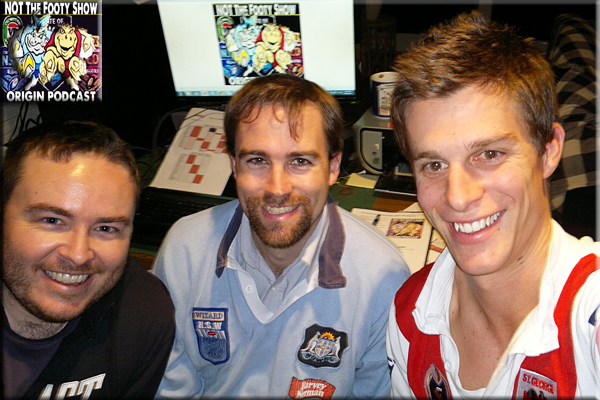 The NTFS Crew is back in business - in-studio hosts Nic McInerney, DC Chapman and Warrick Nicolson are joined by Maria Tsialis and Matthew Duncan to run the rule over the Top 8 contenders last two games. 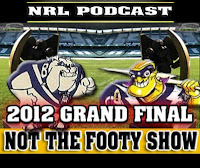 Everyone gives their Final Ladders plus we have Quick Hands segments on Ben Barba to the Broncos, Twitter rage and Fergo being Fergo... Plus with DC and Nic in the studio... plenty of footy dribble ensues at the end of the show. This is a longer Podcast than we'll be producing for the month of September but only because the nature of having to look at the draws of all 16 teams meant it cracked 80 minutes. However we'll be back with 10-15 minute 'Mini-Pods' regularly from this weekend on. 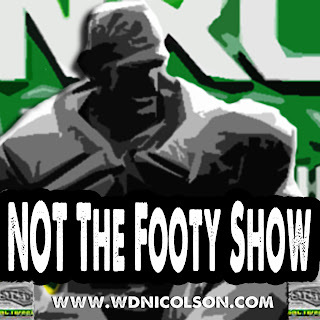 LIKE the show on Facebook to discuss the upcoming month of NOT The Footy Show or catch us on Twitter: @NRLTweet or our individual accounts @wdnicolson @Mr_DC11 @mtsialis @mrpeninsula and hopefully very soon Nic McInerney's Twitter handle will be available to follow. Good to have us back? Please let us know if it is by sending us a Tweet or posting on the Facebook page. Just watch and enjoy... Warnie's flipper is particularly deadly this series. Who wants to play in a Final... anybody? Not many teams want to extend their stay in September evidently - as we wrote last week how 7 teams still could fit into 2 open playoff spots... and a week later - those same 7 teams can still fit into 2 open playoff spots. Not because every one of those 7 teams played like their playoff lives depended on it in Round 24 - but because by and large - they all stink. The Knights, Titans, Raiders and Broncos all lost after entering Round 24 in 7th, 8th, 9th and 10th spot... meaning they win and they move themselves further away from the teams in 11th, 12th and 13th. Those teams were the Cowboys, Panthers and Warriors... who all won. Yet if the 13th placed Broncos beat the 7th placed Knights on Friday - it is possible that the Knights could still be in no worse than 8th spot and the Broncos will be no better than 9th. The Cowboys, Titans and Panthers could all lose, leaving the Raiders-Warriors game effectively a playoff for a current spot in the Top 8 - regardless of who wins the Broncos-Knights clash. Yet if the Cowboys, Panthers and Titans win... well you get the idea - the whole Top 8 makeup is all over the place. Not because teams are playing particularly well (Cowboys aside - who are riding Johnathan Thurston as far as he can carry them) but because most of them can't string a few wins together than would secure them a playoff spot. That all being said however - with the Sharks beating the Roosters to go into 5th - no team from 6th to 13th will trouble any of the Top 4 teams in September... but it'd be nice to at least get to play another game right? Anyhoo - #NRLTweetPOTY Award voting allocation is below as is the rest of what you need for your weekend of footy. Latest of Late Mail and Round 25 Tips below! SCG Podcast Special - We're back for a limited time! 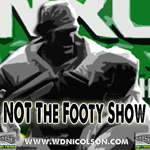 Warrick Nicolson and DC Chapman return for a shorter, snappier Podcast 'live recorded' from the Sydney Cricket Ground for the Dragons-Tigers clash. 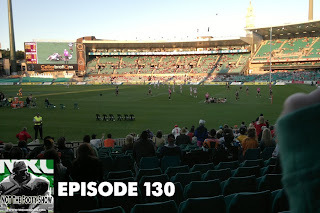 We've got a few of the younger brigade with us taking in the SCG for the first time and this is just our way of introducing a slightly different format to the show - hopefully more natural footy chat instead of being chained to the same format every week. LIKE the show on Facebook to discuss the upcoming month of NOT The Footy Show or catch us on Twitter @NRLTweet @Mr_DC11 and we'll see if we can get Nic McInerney on Twitter by Thursday. 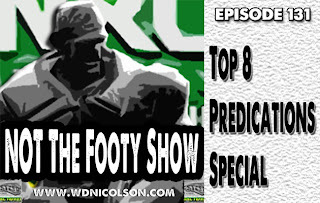 We'll release our Top 8 'Predications Special' on Thursday night August 29 with the whole crew either live in studio or via the phone (that's DC, Nic, Waz, Maria, Matt and Jake!) Good to have us back? Please let us know if it is by sending us a Tweet or posting on the Facebook page. Waz, DC and Nic... together again next Thursday! Crunch time... how will you pick from here on out? 1. If you lead... PICK FAVOURITES. 2. If you are behind by 1 or 2 tips... PICK FAVOURITES and think about only one point of difference each week. 3. If you are 3 or more back... BACK THE SEMI-UNDERDOG as much as possible, because those above you are going to be taking the favourites. 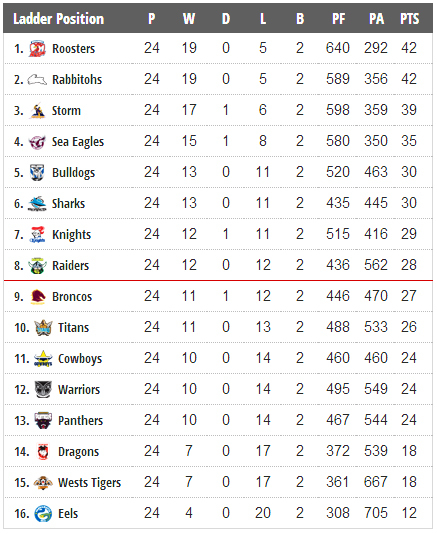 That being said - stick with the Roosters and Storm the rest of the way, but the Rabbitohs or Manly are back againstable... as are the rest of the current Top 8. And the final bit of advice - don't pick Parramatta. There you go... victory is at hand! Latest of Late Mail and Round 24 Tips below! Here's a quick run-down of the final 3 rounds for the teams still in contention for the Finals. The Roosters, Rabbitohs and Storm are definite Top 4 finishers, Manly need to win only one of their last 3 games to get the final spot, while Canterbury and Cronulla sit on 28 points - needing themselves just one more win to secure a Top 8 berth. That leaves the two remaining playoff spots open... and there are up to seven teams who can still mathematically extend their season beyond Round 26. Well some teams have only themselves to beat... others need more than a few favours - and that's even if they win out! Top 8 Scenario: May only need to beat the Broncos in Round 25 to ensure they get in due to a superior differential than Brisbane given both are on odd competition points. Win twice and they probably finish 7th. Top 8 Scenario: Despite being in 8th right now - they lose to the Warriors and this looks all over. Hardest final two games in the comp - both away to the likely Minor Premiers and then the defending premiers. 26 points won't be enough so they simply have to cause a huge upset in the other games to make it. Top 8 Scenario: Can make things interesting if they first beat Penrith then Newcastle in back to back weeks - that may even put them into the driving seat for a Top 8 spot before the Bulldogs game. Win all 3 and they make it. Top 8 Scenario: Need to win all three games and rely on other results but by knocking off the Knights they would open their playoff door just a little wider. Top 8 Scenario: Must win all three, rely on results and can forget about the Finals if they lose to the Broncos on Friday. Top 8 Scenario: Need to reach 28 points due to their poor differential - so must win all 3 games but face two opponents who are ahead of them competing for a Top 8 spot. Game v Raiders the biggest of all 3 since Canberra is the only other team on even points (in contention) that they have a better differential than. Want to discuss your team's chances at making the Top 8? For the first time this year www.wdnicolson.com was not the first place you could find the coming weekend's late mail on a Wednesday evening and judging by our research - you had to wait til Friday morning for anything resembling Late Mail.... note how it is usually Thursday? I've done a trip to Dubbo and back for work and barely made it home last night before the flu (I acquired from my lovely nephews and nieces a few days ago) kicked in... so you are really lucky you are getting anything today (Friday) as I've got the shaky shakes deluxe. 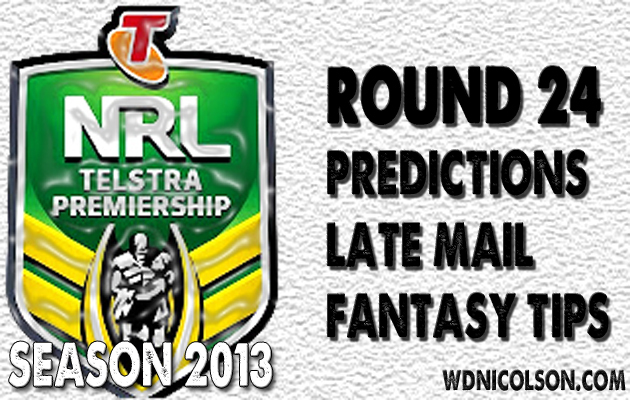 It is a different 'quick hit' format below due to being pressed for time but normal service will resume for Round 24. Latest of Late Mail and Round 23 Tips below! Just a courtesy post to let you know that the full NRL Injured List and Round 23 Tipping Preview and Late Mail features will not be updated until the following times due to a business trip that leaves me unable to allocate appropriate hours to the regular items that go up on Tuesday/Wednesday. 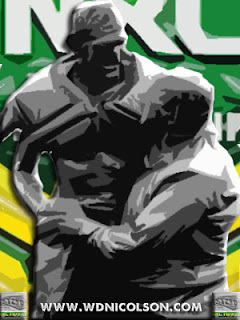 NRL Injured List - Round 23 squads are incomplete - they will be updated for Round 24. Apologies for any inconvenience but there has been and will simply be no time to cover these features properly until later in the week. Either way - for the DT/SC tragics - you're probably already stuffed due to injuries and you've heard about most of them by now! Good luck with your tips and fielding full strength Fantasy Squads - will have the content you know and love up on www.wdnicolson.com later in the week.